WESTEROS might just be a fantasy created by George R. R. Martin, but what lies beyond the Wall has become reality — at least for the next four months, thanks to Lapland Hotels. In time for the epic HBO drama’s final season (commencing April 15), the Finnish hoteliers have partnered with HBO Nordic to give avid fans of the series a chance to live like a wildling in an ice hotel made of snow and ice. 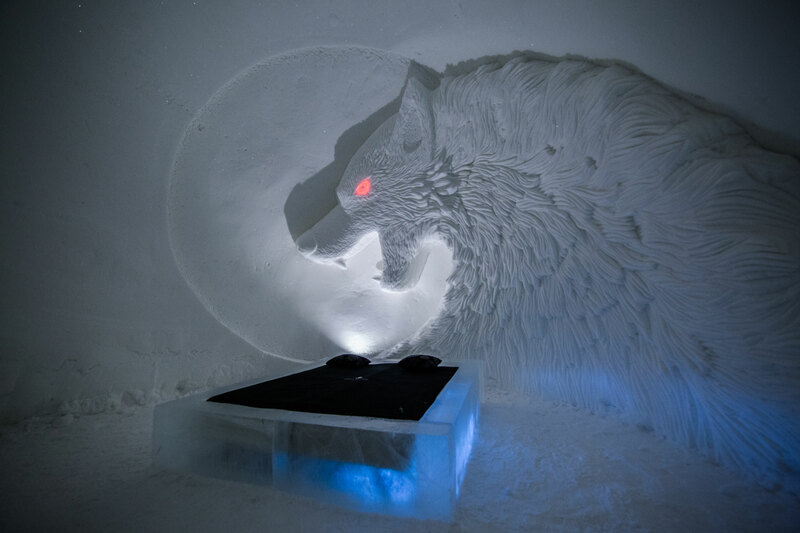 The Game of Thrones Ice Hotel is located in the Laplands Hotels SnowVillage site at Ylläs, Finland, and this is the second time it’s popping up for the winter season. The entire resort is brimming with iconic locations of the show, including a pre-Cersei Sept of Baelor and of course, an iced-up Iron Throne. The bite from this throne will be gifted by ice, not iron. Inside each of the 16 Ice Suites, you’ll also be reminded of how it’s like to live beyond the wall, with either giant faces of White Walkers staring down at your bed or the Unsullied Army guarding your dreams. The Sept of Baelor recreated. Might be a little more messy should Cersei decide to burn this place down with wildfire, though. Janne Pasma, operations manager at Laplands Hotel SnowVillage, shared with us that the reception from the last edition was so overwhelmingly positive that they decided to repeat it this year. “So many did not get to visit us last year, so we gave another possibility for that, and we created an even better one,” said Pasma via email. Just looking at the images and you’ll notice how uncanny the sculptures look to the actual characters themselves (although Drogon does seem to have downsized a little). To ensure that the ice stays cold and doesn’t melt while you’re sleeping, the resort is kept at a cool 23℉ throughout (that’s -5℃). Unless you’ve giant or dragon blood running through your veins, the hotel recommends you stay in the ice rooms for only one night, and book a couple of other nights in their cosy cabins with heat. There appears to be no better place in the world to binge on past Thrones episodes when you’re having a staycation here. The team have also created an ‘Ice Restaurant’ a la Winterfell where you can enjoy a 3-course dinner and an ‘Ice Bar’ to sip on some wine, Tyrion-style. You could even get married in the Sept of Baelor’s chapel if you and your partner are both avid fans. If she isn’t by then, you know what to do. We’d rather have a direwolf than a Night King standing guard over our beds as we slumber in the winter. While the thought of sleeping in an igloo for just a night might seem like a stretch, it shouldn’t be an issue for Thrones fans. After all, we’ve waited almost two years for this final season. What’s one night under the watchful gaze of the Night King? Just make sure you sleep with some Dragonglass under your pillow. If you haven’t already seen the latest, chilling Game of Thrones trailer, watch it below.